Two-course (£23.50) and three-course (£27.50) menu options in the evenings during the week. They contain seasonal Northumbrian produce, plus interesting and unusual ingredients from their polytunnels and gardens to complement the dishes. Go to the bottom of the page to claim this offer! The style is primarily modern British but with a smattering of international choices for those with a more cosmopolitan palate. 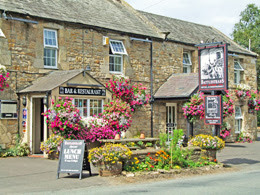 The Battlesteads was also the first winner of our award for Northumberland's Best Sunday Lunch!